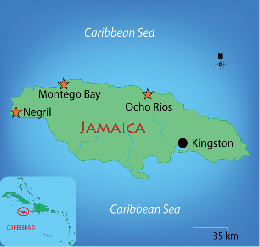 Jamaica's nation multi-cultural mosaic contains African, Asian, European and the Middle Eastern influences. And this wonderful melting pot has created quiet an array of customs and traditions. Resorts will provide you will all the possible comforts and services you can dream of. But take the time to absorb the essence of these people by seeing a performance art, be it theatrical, musical or other. Dance to your heart's content during Carnival or one of the many music festivals such as the Reggae Festival. Enjoy the savoury traditional dishes with saltfish, goat, bammy or sweet exotic fruits. Get familiar with a Rastafarian's way of life. Come and experience first hand the true meaning of the national slogan: Out of Many, One People.